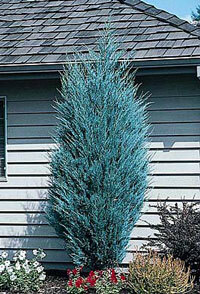 Attractive bluish-green foliage, the narrow column holds its form well without pruning! Excellent vertical accent, useful for landscape framing. Very durable specimen, tolerates heat, cold and drought. Evergreen. Full sun. Slow grower to 10 feet tall, 2� feet wide. Cutting grown. 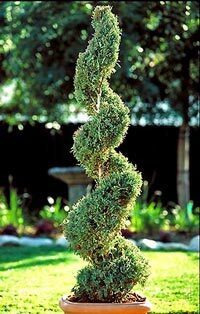 Slender, columnar-pyramidal compact shrub with blue-green foliage throughout the seasons. Requires little pruning to maintain its form. Attractive accent, hedge or windbreak. Grows well in dry locations. Excellent cold tolerance. Dig a hole twice the size of the root ball and deep enough to plant at the same level the shrub was in the container. If soil is poor, dig hole even wider and fill with a mixture half original soil and half compost or soil amendment. Carefully remove shrub from container and gently separate roots. Position in center of hole, best side facing forward. Fill in with original soil or an amended mixture if needed as described above. For larger shrubs, build a water well. Finish by mulching and watering well. Caterpillars are the immature form of moths and butterflies. They are voracious feeders attacking a wide variety of plants. They can be highly destructive and are characterized as leaf feeders, stem borers, leaf rollers, cutworms and tent-formers. Prevention and Control: keep weeds down, scout individual plants and remove caterpillars, apply labeled insecticides such as soaps and oils, take advantage of natural enemies such as parasitic wasps in the garden and use Bacillus thuringiensis (biological warfare) for some caterpillar species. Prevention and Control: Keep weeds down and scout individual plants for tell-tale squiggles. Pick and destroy these leaves and take advantage of natural enemies such as parasitic wasps. Know the Growing Degree Days (GDD)* for your area to target insecticide sprays when most beneficial for controlling the specific leafminer. Seek a professional recommendation and follow all label procedures to a tee. 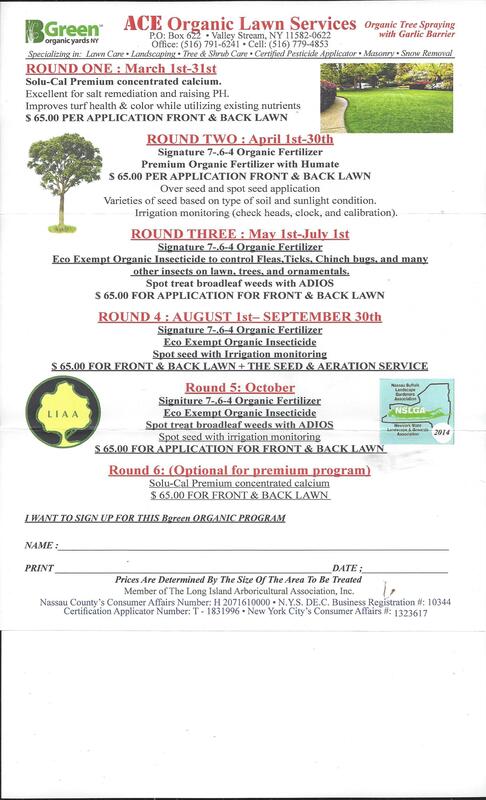 *GDD numbers should be available from your local Cooperative Extension office.